Rent Lodge At Santa Fe | Corporate Events | Wedding Locations, Event Spaces and Party Venues. The Lodge at Santa Fe offers impeccable Southwestern accommodations with great amenities and friendly, professional service. With more than 9,000 square feet of interior meeting rooms and outdoor event space, you'll find flexible floor plans to host your Santa Fe meeting, corporate retreat, wedding, trade show or special event. All of our facilities are warm and inviting, and the décor takes inspiration from our surrounding Southwest heritage. Some of New Mexico's best weddings happen at the Lodge at Santa Fe. Our on-site Southwestern wedding chapel seats 40 guests inside or can accommodate up to 300 in the perennial courtyard with ever-green grass outside. From wedding receptions to corporate conferences, the Kachina Ballroom serves as an elegant Santa Fe banquet hall. The Ballroom can hold up to 225, and several smaller breakout rooms are easily accessible. For an unforgettable outdoor meeting space in Santa Fe, the Enchanted Perennial Courtyard can hold—and enchant—up to 300 people with its lovingly landscaped gardens, arbors and fountain. It is a unique venue for everything from engagement parties to speaking engagements. 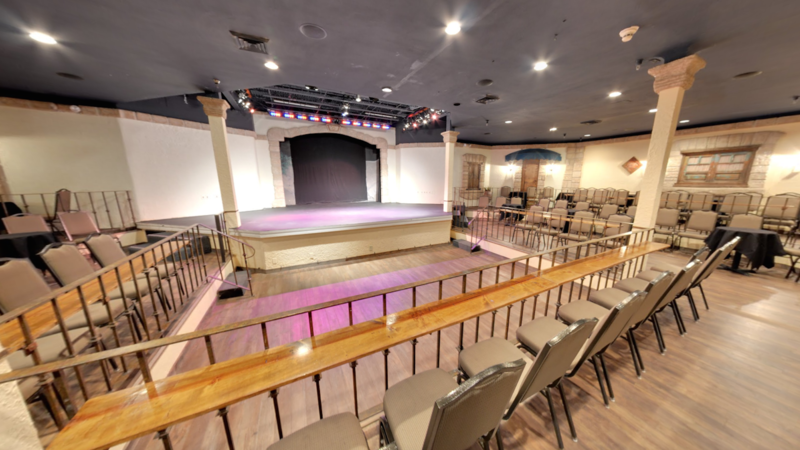 Named for the famed flamenco dancer, the 2,000-square-foot Maria Benitez Theatre is a flexible meeting space in Santa Fe with a stage that is perfect for presentations and performances. The Theatre has a seating capacity of 150.